I once accompanied a friend on a shopping trip, at his request, to ease the frustration he experienced when deliberating over clothing choices. Invariably, he informed me, there had always been some partially interested female who would accompany him, their spirits strengthened by the promise of brunch at Le Caprice, to advise on his questions; “Is this too tight?”; “Am I allowed to wear this?”; “Will this look stupid on me?”; “Does this make me look gay?” On this occasion, there was no such female; the friend was in the middle of a brief ‘dry patch.’ We two alone, wandered through the emporia of central London together. I learned a great deal about him on that trip. I also learned a great deal about the psychology of self-determinism. Men want just as much, just as often as women – they might roll their eyes at handbag lust, tut-tut at shoe envy and shake their head in disapproval at the creaking racks in a girlfriend’s wardrobe but they have their little ‘adored treasures’ too. The problem is, many men are unwilling to purchase said treasures with their own money. Whereas women adopt a truly enlightened approach towards treasure-shopping (‘Buy now, repent later’), men crumble when attempting to summon the courage to secure these items. There is something about handing over one’s own money that causes one to ask ‘Why am I DOING this?’ At the till, the eyes scan the item with a nervous flicker; fearful thoughts rocket through the mind as the conscience hammers away. For some items, such an experience is simply endurance. For the ‘treasures’, the items a gentleman would dearly love to have but simply could not buy, the experience is horrific. I myself have experienced a peculiar hand shaking, palm-sweating, head-pulsing sensation when indulging. Exceedingly unpleasant. To avoid this awful physiological reaction to self-indulgence, men who are reluctant to exact self-determinism may wish to pass on weaker, subliminal hints to those dear to them in order that it may be a merry Christmas for all. Variously named ‘evening pumps’, ‘opera pumps, or simply ‘pumps’, these shoes are one of the most controversial wardrobe items in a gentleman’s wardrobe. Countless panicky threads are begun on style forums asking, democratically, for permission and approval; “Should I buy them?”; “My girlfriend said they’re really feminine…”; “£300 is a lot for evening shoes”; “I like them, but…” The men who know their own mind will purchase these shoes in a blink. However, most men cannot justify the expenditure. Their fear is that they will be laughed at, in a comical style, on the very first occasion they wear them; women and men, their very sides splitting, on seeing such dainty shoes. It is these thoughts that cause men to place the plastic back into the wallet, shake their head at the puzzled store assistant and exit onto the street, breathing a sigh of relief. Were it to be another who purchased said shoes for the gentleman? Well, now that’s a different matter. There are many men who consider a dressing gown (not a towelling gown) to be an item of antiquated extravagance. 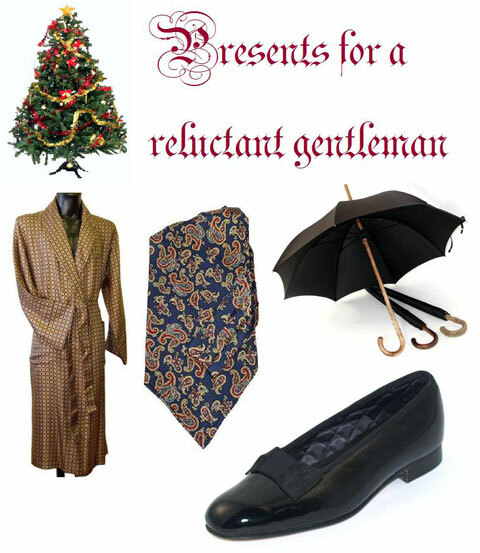 In an age when most men are happy to answer the front door to strangers whilst wearing only their boxer shorts, a gown that was first designed to cover a gentleman’s ‘state of undress’ – (a shirt, waistcoat and trousers) – on the occasion of receiving visitors into his abode, is rather superfluous. Thinking over their rather busy and unfortunately inelegant day, men sneer into the windows of Harvie & Hudson, scanning the silken gowns draped over the mannequins thinking “Nice? Yeah. But when will I wear it?” If you happen to be bought one? Nearly every day. And you’d be the better for it. Whilst browsing the website of Swaine Adeney & Brigg, a snooping colleague leaned over my shoulder and uttered a gasp of horror; “£300 for an umbrella? !” Coolly ignoring their hot-headed naivety I flicked to the silver handled version. “Yours” I said, taking a bite of BLT “for £825.” No one seems interested in investing in a decent umbrella these days. Aside from a neighbour, whose chestnut handled Brigg I had recently admired, a smart umbrella is something that many people like to dream of but few people wish to buy. “I’ll just lose it” they say “That’s £300 lost.” This coming, of course, from people who purchase iPhones, Blackberries, Mont Blancs and countless other items of ‘loseable’ profligacy. Every man wants one, few men have the courage to buy one. I recently purchased a pair of opera pumps to wear with the rest of my evening ensemble. Without exception, my friends were shocked and/or amused at my “effeminate” shoes; it seems that they had not even considered the possibility of a man wearing such footwear! I am unpeturbed, however, and will continue to wear them. why not? so I got the pen for my Xmas gift! I read your excellent article on horizontally striped dress shirts. I’d like to purchase a couple before Mr. Douglas comes out with ..Wall St. 2.. .
I’m in Toronto, Canada. Is anyone on this side of the Atlantic making them or stocking them?